At the gate of the wastewater pant in May of 2016. 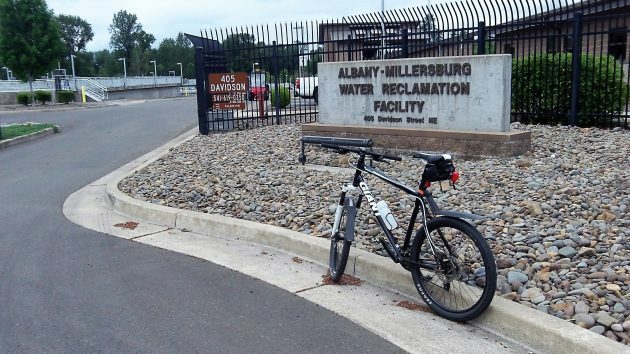 Here’s an update on the Jan. 15 story reporting on the preferred alternative for solving the pesky problem of what to do about undigested solids produced at the Albany-Millersburg Wastewater Treatment Facility — the sewage plant, in other words. On Thursday night, the two city councils agreed to continue investigating composting as the preferred alternative for getting rid of the solids at the treatment plant. The stuff has been trucked to Coffin Butte at the cost of about $650,000 a year since the treatment plant opened in 2009. Among other things, this process will look at potential sites of a composting facility, a phasing plan, regulatory issues, and markets for compost. The effort will also define a layout and refine the estimate of the costs. The cities will call for proposals from consultants to do this preliminary investigation, and after the councils approve one, the study should be completed this year, according to Kristin Preston, Albany’s wastewater superintendent. The site to be acquired for composting should be seven acres in size or larger, and not more than 10 miles from the treatment plant. City officials say they have not yet identified any potential sites. But any site considered should be zoned for industrial or commercial use. Members of both councils were particularly interested in the issue of odor. Public works officials and a consultant said the mixing of the stuff would be done inside a closed building to contain the odor, and the compost itself would smell only like, well, compost. Hundreds of other American cities big and small use composting to deal with solids in the sewage treatment process, the councils were told. No reason to repeat the entire background on this issue. If you’re not familiar with it, check the previous story here. I have composed on my property for years. There is NO smell if you just follow some simple steps. If you want to see the composting process locally visit the Pacific Region Compost Facility near Adair give Republic a call. This stuff turns into “Black Gold”. You can also buy the finished product at Coffin Butte. I urge everyone to consider supporting this effort. I have taken the Master Recycler Training and if anyone would like more information on it I would be glad to help. I too wonder about what the person in the last thread brought up. Human waste is full of toxins, heavy metals, pharmaceuticals (many with minimal studies on long term effects), and illicit drugs to name a few. Where would the compost be used? On grass seed fields? I understand the concern about all the nasty chemicals and metals that will be present in composted human waste, and where it will end up. But where do you think said nasties are ending up now, in our current waste system? I don’t know the answer, but I could make a pretty likely guess…. I for one will not be putting compost from Albany’s wastewater plant on any of my property. There’s a huge difference in the raw materials that go into compost from Pacific Region Compost Facility and compost from the Albany wastewater plant. The Albany plant accepts wastewater from dozens of major industries in the Albany & Millersburg area that uses toxic chemicals whose names I cannot even pronounce, the PRCF does not.